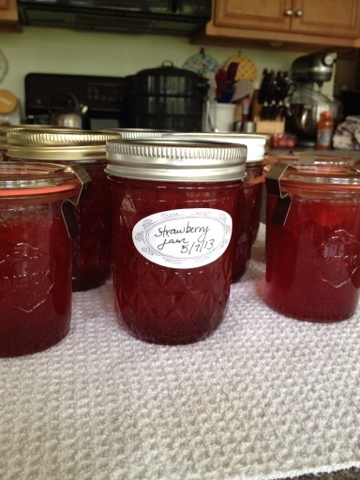 Yesterday I made my first batch of strawberry jam. First batch. It's unbelievable but true. For seasons I have been saying to myself that I'd make some fantastic strawberry jam. And then....it never happens. We miss the picking season. We ate all the berries. I was too busy. Those pesky strawberry rhubarb pies kept being made. Whatever the reason the jam just never happened. Not this year. I would not let another year of strawberry picking go jam-less. I made certain to reserve some strawberries for jam. Oh the complaints I heard. The fear of not having enough pie or strawberry shortcakes or ice cream. We survived. After we picked our berries I spent an afternoon slicing the strawberries into the exact amount required for 1 batch of jam. The work and endless complaints was totally worth it. We have the very best of the strawberry season sitting on my counter waiting to be eaten. I daresay these jars will be horded. Although I did give some to a few lovely ladies because even though I like to think we can eat 10 jars of jam I know that's crazy.